Livestock researchers say the traditional knowledge of local pastoralists in East Africa needs to be included in programs to better control livestock diseases in the region. 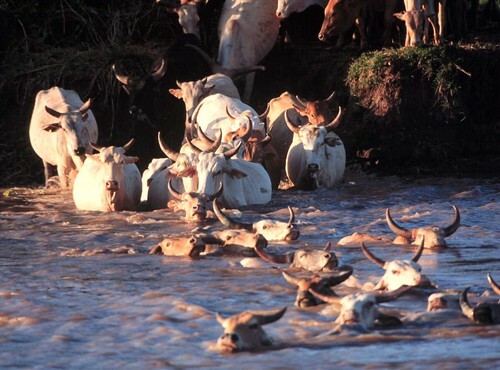 Somali and Maasai herder early warning systems both were key in identifying the risk factors and symptoms of Rift Valley fever in an outbreak in 2006/7. Rift Valley fever is an acute viral zoonosis spread by mosquitoes. It primarily affects domestic livestock such as cattle, camels, sheep and goats, but can also infect, and kill, people, especially those handling infected animals. First isolated in humans in the Rift Valley region of Kenya in 1930, until the 1970s Rift Valley fever was reported mainly in southern and eastern Africa, primarily Kenya, where it was considered an animal disease, despite sporadic human cases. But after the 1970s, explosive outbreaks occurred in human populations throughout Africa, Indian Ocean states and the Arabian Peninsula. Epidemics in Egypt in 1977/8 and in Kenya in 1997/8 each killed several hundred people. Another outbreak in Kenya in 2006/7 killed more than 100 people. 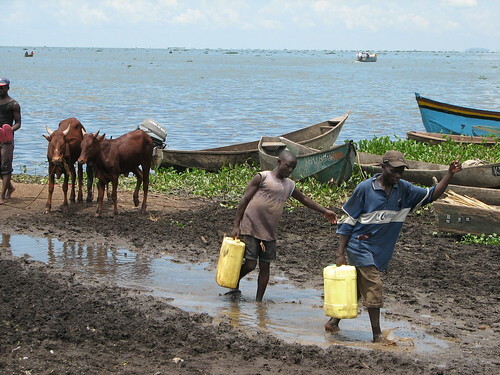 In East Africa, Rift Valley fever outbreaks have coincided with heavy rainfall and local flooding, which can lead to expansion of mosquito populations. In an assessment made to review lessons from the 2006/7 outbreak in East Africa carried out by scientists from the International Livestock Research Institute (ILRI) and the Kenyan and Tanzanian departments of veterinary services, researchers found that Somali pastoralists of northeastern Kenya accurately assessed the likelihood of an outbreak based on their assessments of key risk factors, and they did so long before veterinary and public health interventions began. The study also looked at the experiences of Maasai herders of northern Tanzania, who accurately recognized symptoms such as high abortion rates as indicating the presence of the infection in their herds. Among the environmental factors the Somali communities noticed as likely to lead to an outbreak is an increase in rainfall (usually accompanied by floods) and an increase in mosquitoes. Both preceded the 2006/7 outbreak and had been present in the last outbreak of Rift Valley fever in the region in 1997/8. The Somalis also accurately associated a ‘bloody nose’, or Sandik, in their animals with Rift Valley fever. 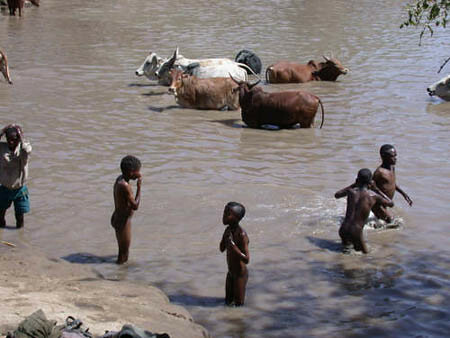 The role of this traditional knowledge in predicting Rift Valley fever is the subject of a paper, ‘Epidemiological assessment of the Rift Valley fever outbreak in Kenya and Tanzania in 2006 and 2007’, published in the August 2010 supplement of the American Journal of Tropical Medicine and Hygiene. The authors say that Somali pastoralists are particularly able to predict not only the symptoms of Rift Valley fever in their animals but also the likelihood of an outbreak of the disease. Indeed, observations by local communities in risk-prone areas were often more timely and definitive than the global early warning systems in use at the time of the 2006/7 outbreak. ‘Timely outbreak response requires effective early warning and surveillance systems. This study points out the important role that livestock keepers can play in veterinary surveillance,’ the authors say. The researchers also say that outbreaks of Rift Valley fever could be managed better if disease control workers were able to run models that combined economic with epidemiologic factors. With such models, they could better determine the benefits of implementing various disease surveillance and control methods, and the best times to implement each method selected for each circumstance. This piece is adapted from the article New journal article: An assessment of the regional and national socio-economic impacts of the 2007 Rift Valley fever outbreak in Kenya by Tezira Lore, communications specialist for ILRI’s Markets Theme. A related ILRI news article addresses the full effects of the 2006/7 Rift Valley fever outbreak in East Africa, including the national and regional socioeconomic impacts of the outbreak and its effects on human and animal health. Africa is now fighting bird flu literally in its backyards. Seven countries have now confirmed they have the deadly H5N1 virus in their poultry populations. These are Nigeria, Egypt, Niger, Cameroon, Burkina Faso, Sudan and Côte d'Ivoire. 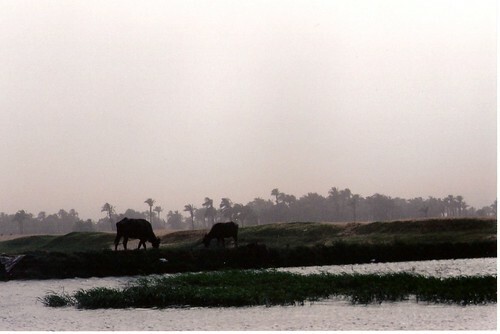 Egypt has reported Africa's first cases of human infections, (13 to date) which have killed five people. Worldwide, bird flu has hit 46 countries, killed 115 people, caused some 200 million birds to be killed at a cost of around 20 billion US dollars, and ruined the livelihoods of millions of smallholder farmers whose livelihoods depend on poultry keeping. From 2003 to 2005 the virus was reported in 15 countries. But in the first four months of this year, it moved rapidly to 31 new countries, with major outbreaks in Turkey, Iraq, Israel, Gaza, Afghanistan, Pakistan, Myanmar and India as well as the seven African states. The World Health Organization (WHO) is working with the United Nations Food and Agriculture Organization (FAO) and the World Organisation for Animal Health (OIE) to improve veterinary services that, in many of the affected countries, have been under-resourced for decades. Dr David Nabarro, the UN's chief coordinator for avian influenza underscored the importance of using veterinary services to fight bird flu and the world's other emerging diseases of a communicable kind, '70 percent of which come from animals', he said. Like many of its partner organizations in livestock research for development, the Africa-based International Livestock Research Institute (ILRI) has been pooling its resources to contribute to the fight against this deadly disease. An internal task force is working on a number of fronts. Several ILRI staff members sit on national avian influenza task forces set up in ILRI's hosting countries of Kenya and Ethiopia and are advising on the design of research support to control efforts in Nigeria. (Kenya's preparedness plan is considered one of the best in the developing world.) 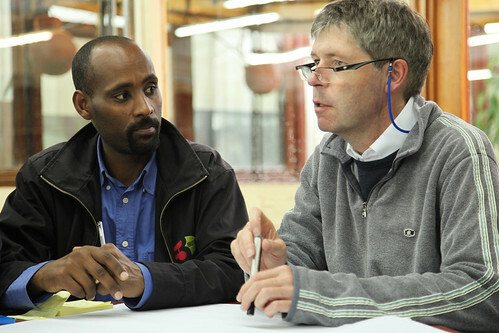 These ILRI staff are providing their veterinary and research expertise to advise on surveillance, monitoring diagnosis and control programs established to prevent or control the disease in poultry. ILRI scientists are also preparing studies intended to generate practical information for immediate use by authorities, veterinarians and the public. These studies will compare different control strategies and assess their impacts on the poor and assist governments to prepare action plans for surveillance, control and containment of outbreaks. In longer term research, ILRI and its partners have proposed exploring the genetic make-up of chickens to unravel attributes influencing infection and transmission of the highly pathogenic form of avian influenza in various breeds. In addition, ILRI and its sister Future Harvest Centre, the International Food Policy Research Institute (IFPRI), are convening a consultation of interested partners from the international research community to explore ways in which research can support efforts to control highly pathogenic avian influenza. This scientific consultation will focus on the needs of developing countries and their poor populations of poultry keepers, sellers and consumers. The meeting will be held at ILRI's Nairobi headquarters, probably in early June (dates will be confirmed shortly). Participants at the meeting will respond to requests ILRI, IFPRI and other research institutions are receiving from donor organizations. Donors want to know how to target their bird flu research investments so as ensure that those investments support effective control of the disease while minimizing the negative impacts on the poor. ILRI is also assembling a team to undertake a rapid appraisal of past experiences in controlling bird flu. Because implementing conventional response strategies against bird flu in many developing countries can be problematical and may place particular hardship on the poor, many of whom rely on poultry for their livelihoods, this rapid research study aims to synthesize lessons learned and identify strategies that may offer more 'nuanced' means of controlling the disease while protecting the livelihoods of the poor. In 2002, ILRI produced livestock density maps (see Mapping Poverty and Livestock in the Developing World by Thornton et al., ILRI, 2002) derived from new analyses locating major populations of poor people (including poor livestock keepers), assessing how these populations are likely to change over the next half century, and showing estimated populations of different types of livestock around the world. In recent weeks, using data sets provided by the Food and Agriculture Organization of the United Nations (FAO), ILRI prepared Africa and global maps of chicken densities. These maps are being used to determine areas under greatest threat and to help those countries already afflicted to target their disease control efforts. The maps do illustrate, however, the wide extent of 'backyard' chicken keeping in Africa—and thus the likely ubiquitous nature of any adverse impacts on the poor stemming from the appearance of bird flu or programs implemented to control it. The African and global chicken maps underscore the need to vastly upscale efforts to collect and improve our baseline information on poultry keeping. Indeed, the poverty of our information on poultry keeping in Africa is one of the biggest challenges facing agencies committed to fighting the new scourge. The chicken density map for Africa, below, represents a snapshot of chicken distribution for the mid- to late 1990s at sub-national level. The white areas on the map represent areas that have no reported livestock numbers available. Despite limited data, this map gives an indication of the enormous threat bird lu poses to sub-Saharan Africa. With 2002 household data from the Uganda Bureau of Statistics, ILRI produced in March 2006 high-resolution poultry maps for Uganda. The maps give important details on densities of local chickens, exotic chickens, ducks, geese and guinea fowl. Most local chickens are reared in the northeastern region and there is a high density of exotic chickens around major urban centres—Kampala, Jinja, Entebbe, Masaka, Mpigi and Mbarara—where demand has outstripped supply of local chickens. To view the Uganda maps, see ILRI's previous Top Story, Bird Maps for Uganda. ILRI and Uganda experts have just produced a series of poultry density maps for Uganda, which will provide information on potentially threatened areas in the event of bird flu reaching the country. Africa is on red alert for bird flu, with five states – Egypt, Nigeria, Niger, Cameroon and Burkina Faso- now having confirmed cases of the deadly H5N1 strain in poultry. Uganda, located in eastern Africa, has an estimated population of 25.3 million and an annual population growth rate of 2.7%. Despite Uganda’s progress and concerted poverty reduction efforts, poverty is still widespread, with an estimated 38% of the population living below the national poverty line. The latest figures show the average life expectancy of a Ugandan is 43 years (47 years in 1990), infant mortality is 83 per 1000 live births, and under 5 mortality is 141 per 1000 children. The annual number of births is 1.3 million, but an estimated 184,000 children under 5 die each year. Agriculture is the most important sector of Uganda’s economy, contributing over 32% of GDP and employing over 80% of the work force. The poultry maps give a visual representation of poultry density in Uganda, including total poultry density, local chicken, exotic/cross-bred chicken, turkeys, ducks, guinea fowl and geese. The maps reveal that almost 50% of agricultural households keep local chicken, but only a tiny proportion (0.7%) keep exotic/cross-bred chicken. Most local chicken are reared in the eastern and northern regions. For households rearing local chicken, 80% had less than 10 birds. The maps also show high densities of exotic chicken can be found around major urban centres like Kampala, Jinja, Entebbe, Masaka, Mpigi and Mbarara. 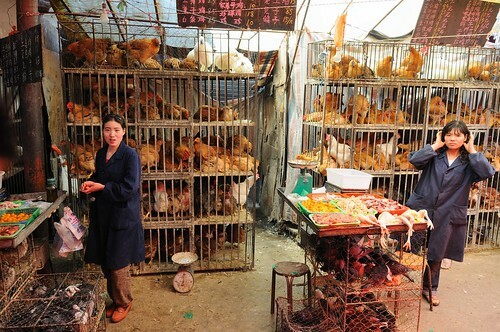 In these densely populated areas, demand for chicken has outstripped supply of local chicken. Many are now rearing exotic chicken mainly for economic gain. Of the households that rear exotic chicken 56% have less than 10 birds, with the vast majority (80%) having less than 100 birds. These maps complement poverty maps published earlier this year. See Where are the Poor in Uganda?